What makes entrepreneurs different, and where do they come from? Are they born or taught? Are they unusually mobile in their careers? Does geography play a role? Do mentors and relationships matter? Numerous studies explore these questions by surveying hundreds of entrepreneurs. At LinkedIn, we take a different approach, on a different scale. By sifting through more than 120 million public profiles, we can analyze tens of thousands of startup founders'  profiles - and find common threads linking their careers. Our infographic above shows the top over-represented business schools among entrepreneurs - with Stanford, Harvard and MIT Sloan taking the top spots. 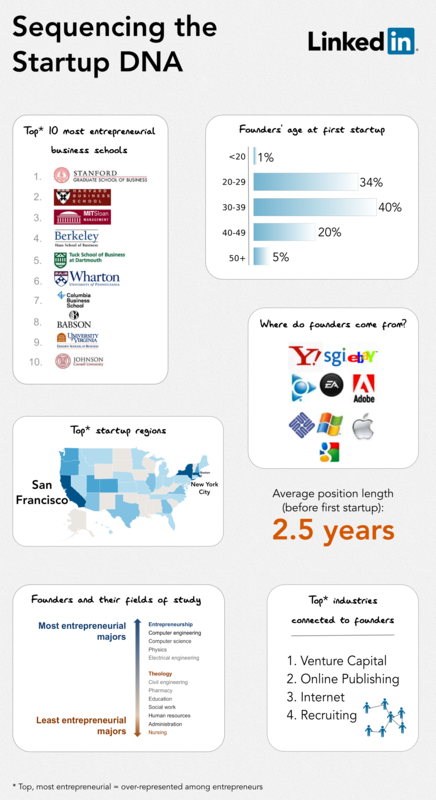 If that doesn’t come as a surprise to you, take a look at the distribution of the founders’ age at their first startup. While young (and serial) entrepreneurs are often in the spotlight, our data shows that 65% of entrepreneurs are 30 and older - and only 2% are serial entrepreneurs. The value of a formal education for startup founders is a hotly debated subject. Let’s take a look at the data - in particular, the fields of study that entrepreneurs chose in college. Technical majors (except civil engineering) are over-represented among founders; nursing and administration are under-represented. While computer engineers find it easier to start companies in their areas of expertise, civil engineers and nurses need more infrastructure support. Some companies are breeding grounds for entrepreneurs - they’re more likely to appear on founders’ profiles than others. They include tech-heavy companies like Adobe Systems, Apple Inc., eBay (including Paypal, of the Paypal mafia fame), Electronic Arts, Google, Microsoft, SGI and Yahoo! among others. Are some industries harder to break into than others? Yes, according to our data: founders of semiconductor and pharmaceutical startups usually have previous industry experience, while founders of retail, consumer goods, leisure & travel and professional training companies don’t. Also, most “academic” startup founders (those listing higher education as their previous industry) are in nanotech, biotech and medical devices. Relationships and mentors are crucial to entrepreneurs’ success - and this is reflected in the connections they have on LinkedIn. Founders are disproportionately connected to venture capitalists, bloggers and recruiters. Most importantly, LinkedIn and the relationships they build in their career help founders find the capital, publicity and talent they need. If you’d like to hear more about the entrepreneur DNA, take a look at the presentation I gave at the 2011 Startup Festival. Startup Founders are LinkedIn professionals who identify themselves as founders (or co-founders) of U.S. companies created after 2000, with a LinkedIn company profile, and that currently have between 2 - 200 employees. We have excluded small law, consulting and real estate firms, as well as LLCs (limited liability companies) - and assembled a pool of over 13,000 entrepreneurs. We then compared them with the average LinkedIn member and highlight characteristics that disproportionately appear among startup founders. Office Pet Peeves - Are you driving your colleagues up the cubicle wall?